I think there are many who need an extra dose on style. There are many men who think that their dressing is very impressive and they have the best wardrobe. Well well well go through this article and you will get to know whether you are an eye catcher in your dressing or the one who needs to change!! Every man loves the feel of cool summer tees but sometimes when you have chosen a wrong one according to your body type, they just look so ewww!! If you don’t have a gym kind of body better wear t-shirts which don’t hug your body tight. Let yourself breathe. After all nobody is going to get impressed with that ball kinda look of your tummy if not six pack abs. Choose t-shirts which are little bit loose. And if you are not a college goer then polo necks will suit you best. It adds to the personality. If you don’t know which clothing will suit you best then better take someone along with you, who for sure has a good taste and the one who will be honest in giving opinions while you shop. Don’t hesitate to ask the one you can rely on. When it comes to the colour palette, go for earthy – beige, brown, military green, red, black and mustard for shirts, trousers, jackets and waistcoats; and I think the ideal choice for summer wear fabrics are metallics, crinkle cotton, suede and cotton. It all depends on your mood and where you are going to wear the stuff. O boy, please don’t go for those skinny jeans or tight pants if you have thin legs. Do you really think its going to suit you. Instead you can opt for straight fit or little lose denims which don’t look like a showcase for your thin legs. Always remember you don’t dress to show your flaws but best things. And with smart clothing you can create the illusion of that perfect physique. 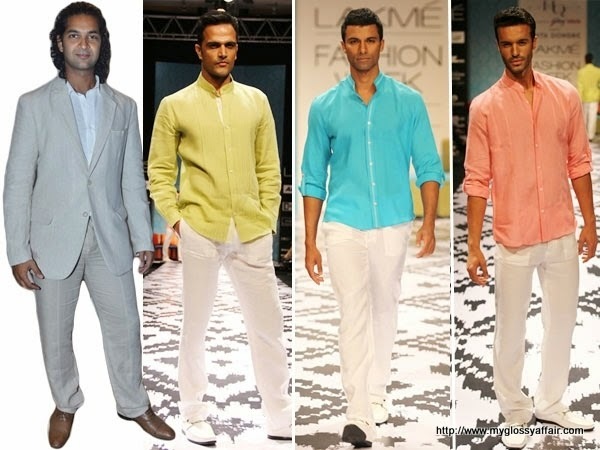 Go for linen pants, this material suits almost everyone and is way too comfortable. And white linen pants are for all the seasons when nothing else clicks to your mind and there is a whole well of options to pair it with. Make some space in your wardrobe for single pleated chinos!! This will deliver a polished and crispy tailored look. So boys , which type are you – blunder or smart dresser. Do make some changes in your wardrobe and be smart and hunk forever. Men are need style just like us:). Have a good day honey:). Wow awesome man fashion and they look hot. Brilliant post,hubby needs to check this out. Great fashion tips for men. Interesting post. Sadly my husband doesn't really care to dress in style. Just tshirt and jeans thats about it. Thank you so much for the tips! Nice foto and perfect blog! Hello, following you now via gfc, google + and bloglovin. Awesome…white kurta & shirt are something I always would always love my man to wear. Great tips! This will be very helpful for men! Follow me if you like me blog. This is so true. Wearing items that fit properly can make all the difference! Stylish men, love the simply look ! AMAZING DEAR, I TOTALLY LOVE YOUR STYLE! These were really interesting ideas! I am thankful for your comment. Have a wonderful weekend! I followed you on bloglovin, please, follow me back, if you want. This is a really interesting post. I love the pink shirt on me too. hello, and I follow GFC, G+, FB, blogovin, , I follow me? If you'd like to follow each other on GFC or anywhere else, do pop by my blog. My links are at the bottom of my page. Sandy | SMXYC: Lifestyle, Beauty, Fashion.